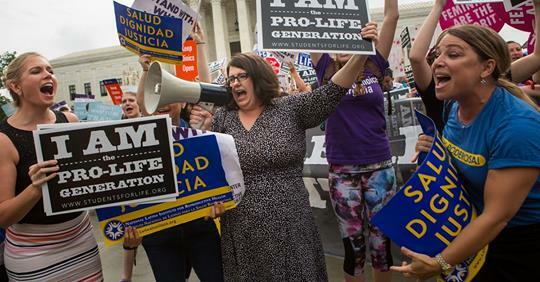 A former state lawmaker with ties to an anti-abortion organization failed to insert “personhood” rhetoric into the Missouri Democratic Party platform—but she succeeded in getting the party to welcome candidates who oppose abortion rights. Kristen Day, executive director of DFLA, confirmed to Rewire.News Wednesday that Barry had served on the organization’s board but said that “[Barry] brought the language herself” to Missouri Democrats. Sources told Rewire.News that Barry did not disclose her past connection to DFLA during discussion of the amendment. While in the Missouri House of Representatives, Barry, who did not return requests for comment, sponsored and voted for abortion restrictions. In September 1996, for example, she voted to override then-governor Mel Carnahan’s (D) veto of a bill placing restrictions on abortion clinics, including a requirement for annual clinic inspections, which reproductive rights advocates said was intended to shut down abortion clinics, as the St. Louis Post-Dispatch reported at the time. In 1999 Barry sponsored a “partial-birth abortion” ban, and in 2000 she tried to amend legislation so that it would block the state’s share of a national tobacco settlement from being used for abortion services. The following year, Barry introduced a so-called informed consent bill requiring a 24-hour waiting period and mandating that doctors inform patients of risks associated with abortion. As the Guttmacher Institute has noted, such laws often force doctors to provide patients with “information that is irrelevant or misleading.” That year Barry co-sponsored another “informed consent” bill to require a waiting period for patients seeking a medication abortion. An archived version of Barry’s 2004 campaign website from her failed run for U.S. Congress show an endorsement from the anti-choice Susan B. Anthony List Candidate Fund. “No one was asking any democrat [sic] to choose to have an abortion. Rather we were asking our democratic candidates to not support making that decision for other people,” Green said in her statement. “Although support for this [phrase] was not unanimous on the committee, the majority approved it and felt that it was a way to support what we heard on the listening tours, be conscious that not all people will personally chose to have an abortion, and that the continued position of Democrats must be that we support women in making the personal choices that they feel are best for them regardless of what we may feel personally,” she wrote. During the platform committee’s deliberations, Barry attempted to include anti-choice language regarding “life from conception until natural death,” which ultimately did not make it into the platform. Such phrasing uses so-called personhood rhetoric that, if implemented into law, could criminalize abortion and some forms of contraception. Jalen Anderson, a Democratic state committee member and chair of the platform committee, said that while Barry’s language regarding “life from conception to natural death” did not make it into the platform, ultimately a “middle ground” was found that he considered acceptable. But shortly before the platform was scheduled to be voted on by the Democratic state committee, Barry introduced her anti-choice amendment, which was then voted into the platform in a move that opens up the party to people holding anti-choice views. Anderson said removing the language would take 15 members of the state committee writing to Missouri Democratic Party Chair Stephen Webber to call for an emergency meeting. When asked whether DFLA intended to seek the inclusion of similar language in other states’ Democratic platforms, Day told Rewire.News the organization would work “once again on the national level” to get it into the platform. “I know some people would rather be in the minority than have pro-life Democrats back in the party, but we have to look at the big picture of what are our goals,” said Day. “Yes, we would like to see abortion eliminated, but we also think there’s more we can do to support women to help them with the opportunity to parent,” she said, pointing to the organization’s advocacy for paid family leave. And if the abortion-focused people like Barry adopted only four children per year, every year, there’d be no need for abortion! But she won’t.